If you’re looking for something a little different but very exciting this Halloween, why not combine two fun events into one with a Halloween Casino Party. At Casino Party Experts, we have everything you need to host a real howling event. Casino parties are one of the most entertaining and popular adult gatherings that easily draw the crowds. With our professional gaming tables, chips, cards and play money, you can quickly turn any party into an extraordinary occasion. Add a holiday theme to your gala and you will quickly add another level of thrills to the evening. This Halloween, start by picking a theme for your evening. Zombies, Vampires and Werewolves, Carrie’s Prom Night, Frankenstein’s Wedding or ghostly ghouls are just some of the gruesome but thrilling festive themes you can choose from. Once you have decided on the topic, send out the invitation emails letting your guests know what the night’s party atmosphere will be so that they have time to get their costumes. Then it’s time to plan the decor. At Casino Party Experts, we have decorations to help set up your venue. We will help you create a dynamic area that will fit perfectly with your evening’s plan. To get an estimate for your Halloween party rentals, call us at (317) 857-0168. Next, we will help you choose the gaming tables for your casino. We have several poker tables to choose from including Texas Hold ‘Em, Pai Gow, Three Card Poker, a standard poker table, Caribbean Stud and Let It Ride. We also have other popular gambling tables to choose from including Blackjack, Craps. Baccarat and Roulette. Our contemporary tables are the same high quality, professional tables that are seen in modern gambling halls. We will even provide the professional, highly trained dealers to run the tables. Your guests will feel like they are walking into an authentic casino when they arrive at your party. If you are looking for other activities along with the card tables, we have a variety of entertainment options to choose from. Our slot machines are just as exciting as those played in real gaming rooms. Our money cube is a must have. While each person stands in the box, forced air will blow money bills, play money, coupons or tickets around. The participant has to try to grab as many as they can before their time is up. For your Halloween party, make it a little more exciting by using blood money, holiday focused coupon deals or tickets towards a ghoulish door prize. Once everyone gets hungry, serve spooky themed appetizers including mini spider web pizzas, mummy wrapped mini weiners, vegetables with dip in a miniature pumpkin, bone shaped cheese sticks with bloody marinara sauce, deviled eggs, a skull shaped cheese ball with crackers, coffin bread with spinach dip inside, bloody finger breadsticks and ghostly fruit kabobs. To drink, offer Bloody Mary’s, white Witch’s Brew, red fruit punch in syringes or green witch’s potion. This Halloween, treat your friends and family to a real thrill by hosting a themed Halloween Casino night. Your guests will have a howling good time playing their favorite card games while dressed up in haunting costumes. 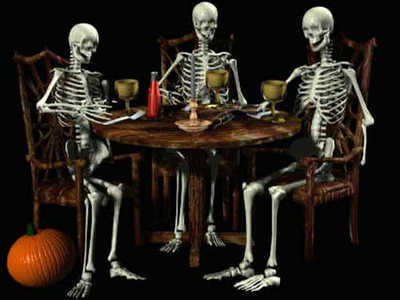 At Casino Party Experts, we can help you plan a real spine-chilling party evening. Give us a call at (317) 857-0168 for an estimate for your Halloween party rentals.